Circular ssDNA genome of about 5-6 kb that is partially double stranded on about 800bp. Encodes for 3 proteins. 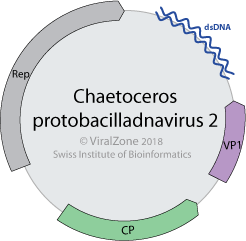 Viral ssDNA is converted into dsDNA with the participation of cellular factors. dsDNA transcription gives rise to viral mRNAs. Viral mRNAs are translated to produce viral proteins. Replication may be mediated by a Rep protein, and would occur by rolling circle producing ssDNA genomes. b) be encapsidated by capsid protein and form virions released by cell lysis.